For some applications, conventional Nitinol machining techniques may not be suitable due to high cutting forces imparted during manufacturing. In instances such as these, electrical discharge machining (EDM) can be employed. EDM allows complex, close tolerance geometries to be produced under minimal to no load conditions. 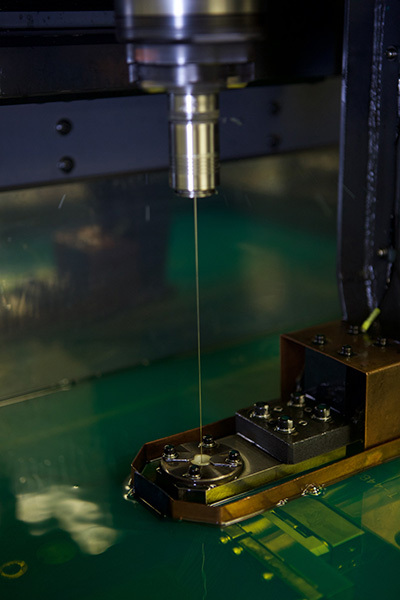 EDM technology is especially attractive for cutting features into Nitinol materials. Cutting is achieved by a charged electrode that is passed through or into the material. As the electrode nears the work piece, it discharges a spark and ablates the material nearest the electrode. A dielectric fluid is introduced into the spark gap to ensure optimal spark integrity and to flush away the generated debris. It has the added benefit of minimizing the recast/heat affected zone (HAZ) layer in Nitinol components. Sinker EDM machining is characterized by a shaped electrode or “negative” that is passed into the work piece. Internal shaped features, including threads are readily achieved by this method.